On a table, the user should be able to edit the values in each cell on a specific column. The current solution is using a multi selection drop-down menu but the user has to scroll through the options, which is a bit inconvenient. The table is wide, and inserting a button into the cells is a problem. adding a contextual button above the table is an option, but that means that the contextual menu has to be fixed, and and it might be a problem since the menu above it isn't fixed. once the button is triggered a pop up window with the cell setting will appear. Can you recommend a conventional method to enable edit of a single cell? Perhaps you could pop up the allowable options in a box as the user types them? 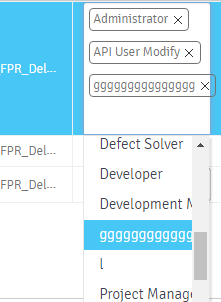 This sort of auto-complete is similar in functionality to the tags editor that you used to add tags to your question. If you're concerned that the user might not know what rules are available, you could always provide a filter-by-typing approach, accompanied by a detailed reference list. 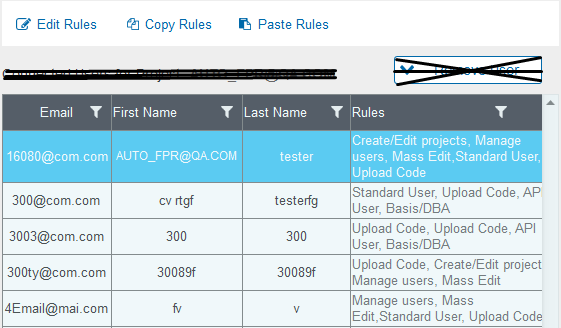 What I mean is, you start by showing every rule in a tabular format (uses space most efficiently) and filter down the list of rules as the user types, eventually showing "No rule found" if they've typed something you can't find a match for. Then, the user would go to the reference list to locate whatever they're needing. As per my view point, Use inline edit to edit single cell and if column contains multiple fields to select like a dropdown checkbox then show respective controls over the cell when user click the cell to edit. For an example : If column is for age then show calender on edit, if it is either or option then show dropdown. invoking the edit action of the cell where you hesitate on putting an extra button in the cell - which takes some space. Why won't you use double click for invoking the edit action? presenting the possible options in user-friendly form when more options are possible. The second one is more complicated. I agree with Jasmin Javia's answer (hence using their mockup) where they suggest to differentiate the type of data and to provide data type specific dialogs. in most cases age changes each year, why not enter the birth date (using calendar input) and dynamically calculate the age of the person? Display the age in the cell but display the birth date in on-hover balloon. Then, depending on whether the option is unique or there can be more options, either close the grid after selecting immediately or add a close button (a cross top right) and allow to select and deselect the options. Not the answer you're looking for? Browse other questions tagged buttons tables popup interactive-ui edit or ask your own question. How to accept multiple types of input to a table cell? Best way to show many user actions for table rows? How to add a details link on a table when each cell is already a link? Inline table edits: how to make it quick to edit? When sort on table column with empty data, what order should empty cells appear in?